Ambris, a right handed batsman, but who was called into service for the Windwards during the three-day format, was among the top five batsmen in the three day and one day limited overs competitions. In the three-day competition, Ambris struck 247 runs to be fourth in the aggregate. His highest score was 84 against the Leewards. 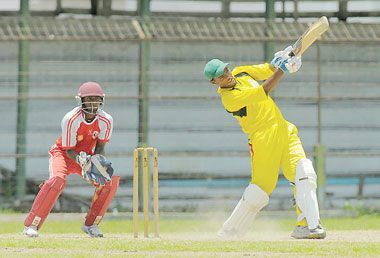 Leading the batting in the three-day format was Jamaican opener John Campbell, who tallied 326 runs, at an average of 81.5 per innings, with a high-score of 175. Windward Islands skipper Kaveem Hodge was second with 253 runs, while T&Tâs best batsman was Akeal Hosein who compiled 248, with a high-score of 98, to finish third on the list. Rahkeem Cornwall of the Leewards was fifth with 217. In the one day limited overs competition, Ambris made 217 runs at 43.4 per innings, with a top score of 98 against Trinidad and Tobago. His efforts helped the Windwards to third spot, behind champions Barbados and second placed Trinidad and Tobago. Barbados captain Kraigg Brathwaite topped the batting in the limited overs. The 18-year-old made 297 runs in five innings at an average of 99, including three half-centuries. Kieron Joseph of Trinidad and Tobago made 167 runs at 33.4 per innings, with a best of 38. Ambris was a member of the regional team in the 2008 Under-15 World Cup, part of a West Indies Under-19 team which toured the USA in July for four matches against their US counterparts. His latest performance puts him in good stead for the West Indies line up in next yearâs Youth World Cup set for Australia from August 11. West Indies has been grouped with former champions India, along with Zimbabwe and Papua New Guinea, to form Group C of the preliminary stage.